Prevention and management of disease is a major task for farmers in tropical horticultural production. This is largely due to the high humidity and warm temperatures. To achieve this farmers use a range of chemicals to manage disease occurrence in their crops. 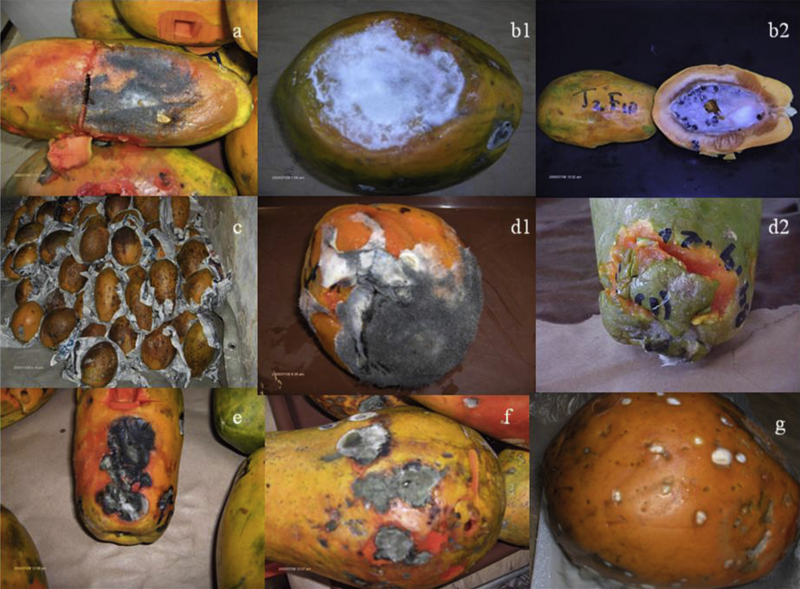 Even by applying preventative chemicals, these pathogens can still infect fruits and vegetables in the field while they are immature, and the symptoms appear on the fruits only after ripening—thus causing damage to the fruit during storage, transit, and marketing (Fig. 1). Figure. 1. Postharvest fungi of papaya cv. ‘Maradol’. a) Mucor sp., b1, b2) Fusarium oxysporum c) Colletotrichum gloeosporioiodes, d1, d2) Rhizopus stolonifer, e) Alternaria alternata, f) Penicillium digitatum, g) Aspergillus sp., (Bautista-Baños et al., 2013). The continuous application of synthetic fungicides can lead to the development of fungicide-resistant strains of the pathogen. Furthermore, where chemical application does not follow strict application protocols, chemical residues on the fruit may cause serious threats to consumers and the environment. Also, using fungicides to control postharvest decays are restricted in some countries and there is a high demand by consumers for agricultural products that have not been treated with chemicals. Therefore, applying of non-hazardous products for controlling diseases during crop production and storage is a promising consumer-friendly and environmentally safe alternative to chemical applications. Research has shown that application of essential oil may be a non-toxic, antifungal method of controlling disease in fruits and vegetables (Calo et al., 2015, Department of Food Science, University of Arkansas, Fayetteville, AR, USA). Essential oils are complex combinations that originate from secondary metabolism in plants. These oils can be extracted from various plant parts such as flowers, buds, seeds, leaves, twigs, bark, herbs, wood, fruits and roots. 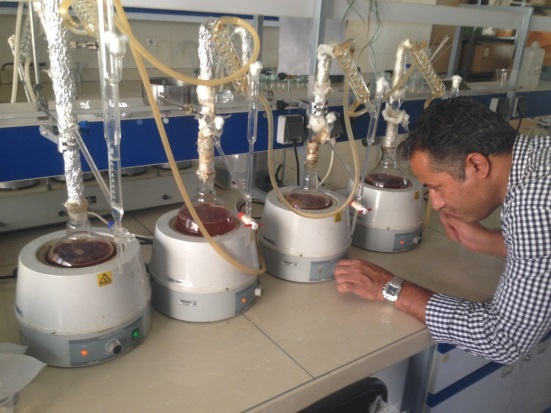 The objective of this study was to evaluate the efficiency of plant essential oils as botanical inhibitors to manage fungal diseases such as; Anthracnose, Phytophthora, Fusarium, Botryosphaeria (cankers) in a more consumer friendly way in field and during storage after harvesting. The air-dried leaves of eight plant species including; peppermint, savory, thyme, cinnamon, lavender, eucalyptus, tea tree, and myrtle were used for essential oil extraction. Using a Clevenger set, the essential oil of each species was isolated by hydro-distillation for three hours (Fig. 2). The extracted oils were stored in sealed, dark vials and placed in the dark at 4°C. The antifungal effects of the essential oils was measured based on the inhibition of spore germination of the pathogen on potato dextrose agar (PDA) media culture. A fungal disc (five mm diameter) from a pure culture of each pathogen was taken from the edge of the culture and placed on petri dish PDA combined with 0.0% (control), 0.0250%, 0.05%, 0.1%, and 0.15% essential oil of each species. Petri dishes were incubated at 25 ◦C, and spore growth was measured daily after 48 hours culturing until the control petri dishes were fully covered with pathogen spore. The efficacy of each treatment was evaluated by measuring fungal colony development on each petri plate (Fig 3). Various plant essential oils prevented fungal growth of pathogens in petri dishes. 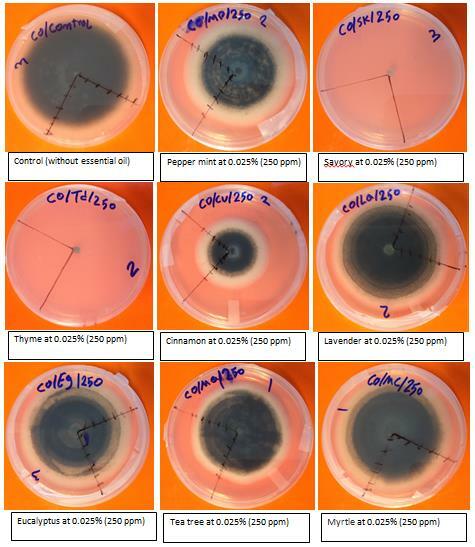 After seven days, the control treatment (0.00% essential oil) for each of the fungal pathogens had completely covered the petri dish by fungal growth (Fig.4). Four doses; 0.025%, 0.05%, 0.1%, and 0.15% of savory and thyme completely inhibited the fungal growth (Table one). Taken together, germination growth of studied fungi can be controlled by plant essential oil treatments, thus illustrating their antifungal potential. The experiment is still in its initial stages and many questions must be addressed. This novel approach will be developed as we examine the feasibility of providing disease protection using essential oils under field conditions during the growing season. The use of essential oils as biological inhibitors offers the potential for consumer-friendly and eco-friendly disease management. Please note that these are laboratory results and will need to be evaluated in field experiments. These compounds are not registered in Australia and should not be used commercially.